Kraftmaid describes its honey spice shade as a warm shade with golden tones. Similar to oak in color, the shade can be used to brighten and warm an otherwise dull kitchen. The stain is available for use on a wide range of woods, but maintains its golden shade regardless of the wood used. Whether you have the cabinets in your home now or plan on installing new cabinets, decorating your kitchen with Kraftmaid's honey spice cabinets can create the welcoming space you desire. Purchase appliances in a neutral color that contrasts with the cabinets, such as black. Lighter-colored appliances, including white and stainless steel, blend into the cabinets and appear to disappear. Paint the walls a shade that has a warm feel, but is lighter than the cabinets and appliances. Think about using shades of tan, light green, pale blue or cream. These paint tones complement the golden color of the honey spice cabinets without overwhelming the kitchen with color. Replace the existing counters in the room with new counter tops in either a black or white color. The new counters will act as a frame around the warm-colored cabinets. White counters help cool down the warmer tones, while black counters make the kitchen feel even warmer. Tile the space over the sink and below the windows or cabinets to create a backsplash that catches any water from the sink before it damages the walls. 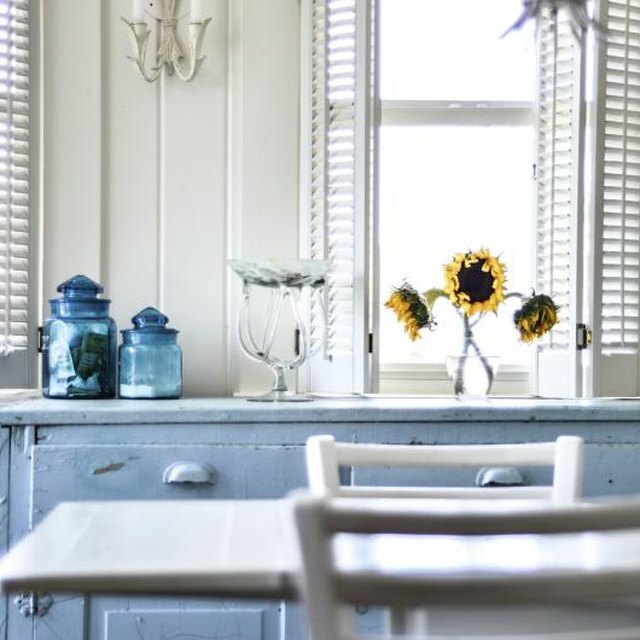 Shades of tan, white, blue cream and brown can be used to highlight the warm tones of the cabinets. Highlight the cabinets with furniture in a color that complements the honey spice cabinets. Use a light shade of wicker furniture paired with black metal legs or oak furniture decorated with a light-colored stain. Consider painting the window sashes in the room a black color and painting the trim in white. These two colors blend easily with any other shades in the room without detracting from the look of the cabinets. What Colors Go With Whitewashed Kitchen Cabinets? Is Gray a Good Color for a Kitchen?